The Westin Resort & Spa In Hilton Head Island, Sc,an island escape with southern charm, is probably one of my favorite venues for weddings in Hilton Head, SC. There are so many special part of this oasis resort that makes it one of the busiest wedding venue in Hilton Head, South Carolina. This coastal chic resort, just renovated the entire hotel, with three outdoor pools, the Oceanfront Pavilion, Pool Terrace and the Pool Deck are ideal for elegant weddings to they're amazing suites, with a balcony that overlooks the pool and beaches, the rooms are large with wooden floors, and have plenty of available light, the ceremony is usually on the deck, witch can hold large amount of family and friends. At this beautiful venue, I had the honor and privilege to capture my clients amazing wedding. The bride spoke all day as I was photographing her with the pre photos images to the bridesmaid and I about how excited she was to see the groom. As I got to the ceremony on the deck of The Westin Resort & Spa, in Hilton Head, Sc, I realized that I needed to be fast and very accurate for this very important moment, on how I was going to capture the groom seeing the bride for the first time, and vise versa, I had an extremely long lens and dialed the shutter speed to freeze and capture this perfect emotion from the bride and her father and I achieved that capturing this priceless moment. I love this image and how it is real and pure how the moment is frozen in time. 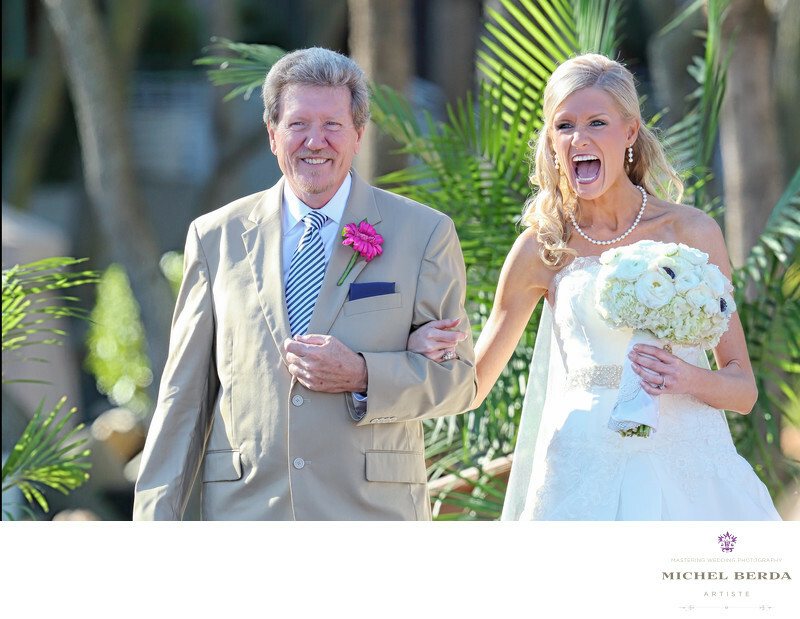 An expression the bride and her father will never forget.Keywords: Destination Wedding Photographer (117), Hilton Head (75), sc (309), The Westin Resort & Spa HHI (27), The Westin Resort & Spa in HHI Weddings (27), Wedding photographer In Hilton Head (66), Wedding Photographers (198), Weddings (168).